For more information on my own books and on island life, including reviews, extracts, videos and background, see The Blue Cabin website. 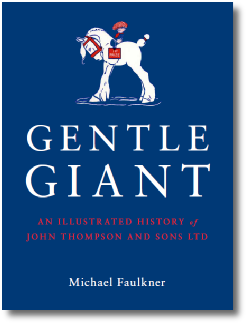 Richly illustrated with over seventy-five photographs, Gentle Giant is the story of one of Northern Ireland’s most innovative companies and gives a compelling insight into the shared histories of manufacturing and agriculture in Northern Ireland. John Thompson & Sons is the largest multi-species feed mill in Europe. It is also a renowned Belfast company, with a rich history and pedigree; and its logo – the Clydesdale, known affectionately as ‘the gentle giant’ – is known to farmers across Northern Ireland. Thompsons has been part of the city since 1870, when its founder John Thompson left his family’s County Antrim farm and opened his first mill in Beresford Street. This book charts the company’s history: the story of the Thompson family; the company’s expansion down the years; the destruction of the mill in the Easter Blitz of 1941; the pioneering changes that Thompsons made in feed milling and animal nutrition; and the vision, business acumen and strong long-term business relationships that helped Thompsons grow its business when many others struggled to survive. The Blue Cabin website has more background on my books and on island life.